Finally, go down to my target point....AFTER I've closed my short position yesterday. That's market, price always hang on just a minute longer than what most traders can bear with. Anyhow, upon closing formed a nice base in a FALLING WEDGE pattern. 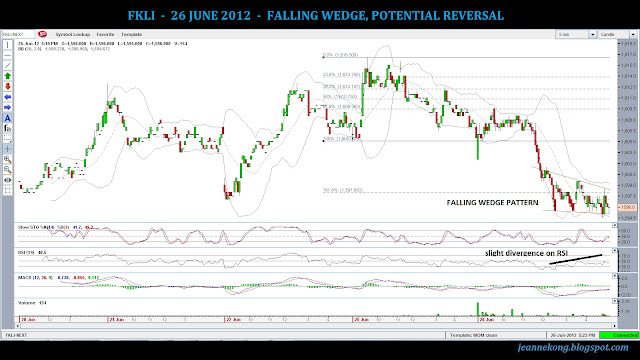 We can look for a potential reversal back above 1,600 tomorrow. CAVEAT is still a flat/positive US & EU performance tonight. Anyway, I haven't make a move yet. As a wise man once told me: When you are not sure what to do, DO NOTHING! Never trade because you want to trade; trade only when there's a trade. So, staying on the safe side, I'll make a move after I get a confirmation tomorrow.